So I have to get a new Windows license for a new PC. 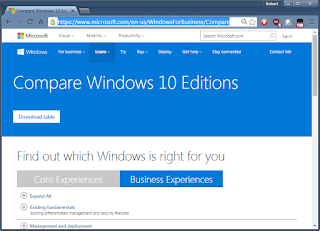 Should I get Windows 10 Home or Windows 10 Professional? What's the difference? Ooh, a button that says "Download Table". That's exactly what I want -- a technical list without all the fluff. I scroll down to the parts that concern me, like encryption. Wait, what? 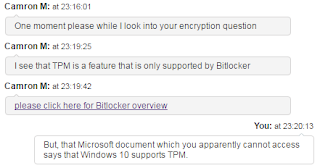 What's the difference between "Device Encryption" and "BitLocker"? 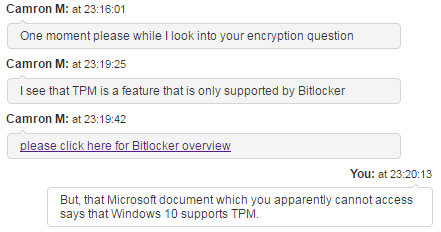 I though BitLocker was Device Encryption?? 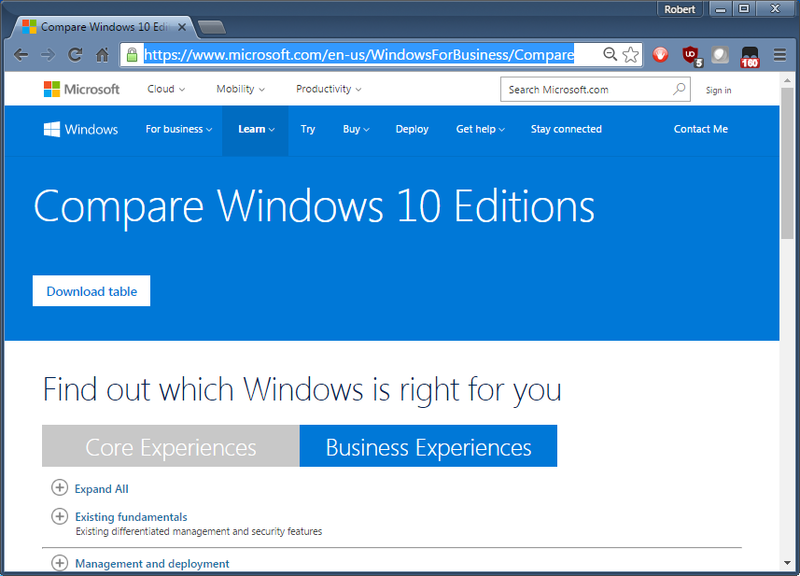 Well, the purchase screen for Windows 10 has this friendly little pop out offering to help. Of course, as a techy, I know that such things are worse than useless, but I haven't tried one in a while, so I thought if I'd see if anything changed. So at first he says they are the same. When I press him on the difference, he then admits they are different. 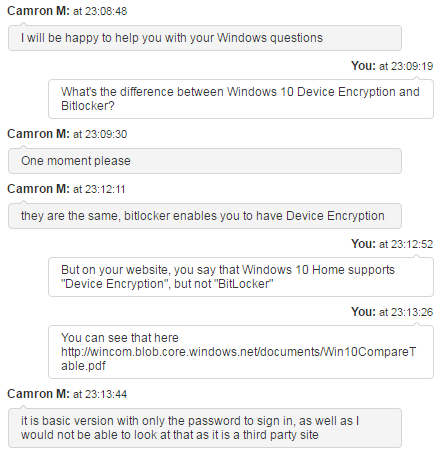 He can't read the document I'm reading, because it's on a non-Microsoft "third party" site. 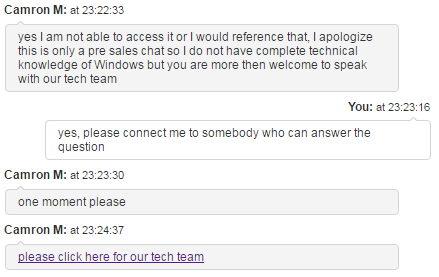 While it's true it's on "windows.net", that's still a Microsoft site, but apparently he's not allowed to access it. I appears Microsoft firewalls their access to the Internet so jerks like me can't social engineer them. At this point, he's acting as a Markov bot, searching Microsoft's internal site with the terms I give him, then selecting random phrases to spew back at me, with no understanding. Support for TPM has nothing to do with the difference. I know this isn't going to work, but I'm in this far, and already planning to write a blog post, I continue the game. Like the previous person, it's all gibberish. He looked up my phrases, then spewed back random sampling of tech terms. So I did figure eventually what "Device Encryption" was. It's described in this Ars Technica post. It's designed for when Windows is installed on tablet-style devices -- things that look more like an iPad and less like a notebook computer. It has strict hardware requirements, so it's probably not going to work on a desktop or even laptop computer. It requires a TPM, SSD, no fans (at least while sleeping), and so on. 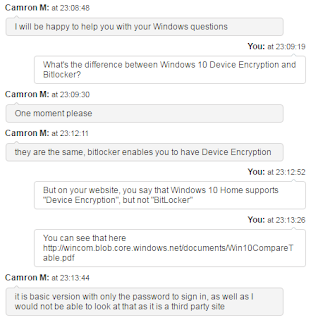 The tl;dr is for people in my situation with desktop computer, Win10-Home's "Device Encryption" won't work -- it only works for tablets. If I want full disk encryption on my desktop, I'll need "Win10-Pro". The idea is that in the future, tech support will be replaced AI bots that use natural language processing to answer questions like. But that's what we already have: tech support search text, finds plausible answers they don't understand, and regurgitates them back at us. In other words, when the Turing Test is finally won, it's going to be in tech support, where a well-designed bot will outperform humans on answering such questions. It is a sad day, when a human cannot pass Turing's test! This should teach us something.